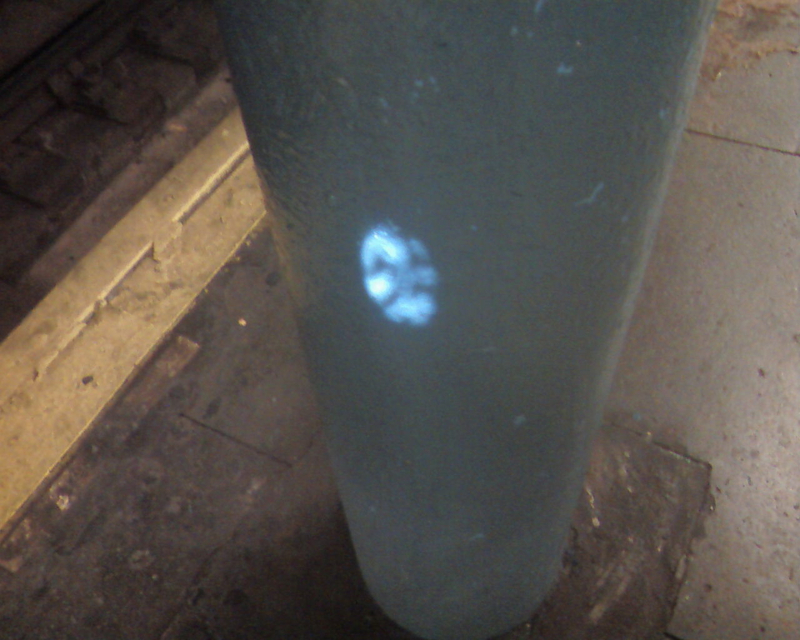 This little beam of light on a column at the Spring St. subway stop is the kind of moment that makes the city beautiful to me. Last year during the transit of Venus I covered all of my windows with tin foil and made a camera obscura in my room in Calumet Mi. It was incredible how well it worked, I certainly didn't expect it to.... I was able to watch Venus pass directly across the sun, which was about the size of a quarter on a piece of paper that I kept moving across the far wall of the room. This little oval of light on the subway column projected the swaying motion of leaves, it was mesmerizing. The light came from a small hole in a steel plate in the ceiling above. It looked like someone had set up a little 8mm projector nearby and was projecting onto the column. While I have to admit that I don't fully understand some of John Latham's work, I do think about the concepts of "least event" and "incidental person" a great deal. I think that a happy life in the city-- or the country for that matter-- could be defined as the privilege of being an incidental person in search of least events... the small, unnoticed, forgotten spaces and moments of beauty that the structure and motion of the city's forms create. I remember taking a hike in the woods during a still day with a friend, and we saw this leaf fluttering back and forth at the end of a low branch, all alone. Nothing else was swaying or moving, the leaf had found some kind of air current that had singled it out and was not affecting anything else. An anomalous leaf flutter. Although my recent focus has been on historic and industrial sound, I've been thinking a lot about experience, and how experience becomes translated into belief systems and personal philosophies, or how personal experience predisposes a person toward particular belief systems. Then, of course, how acting within these belief systems influences experience and how this dynamic then leads either towards or away from social acceptance and nourishment. To single out a person with principles: Look for the saddest person in the room. These benches were built in 1997. 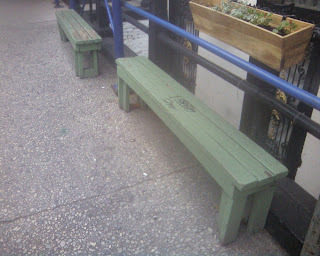 You can find them and sit on them on the corner of 106th and West End Ave. 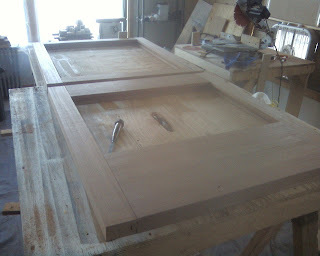 The carpenter's skill level has improved since then. Actually, I can now remember that the problem was that the wood was delivered, and lumber yards frequently like to get rid of their bent and twisted wood on delivery runs because it's hard to reject... It's hard to build with curved and twisted 2 x 4's, but I tried my best. In the late nineties and early 2000's I was in the habit of making little books. I wish I could reproduce them here but they're all in storage still. One of them "This is Where" was concerned with the relationship between thought and the environment. I was wondering at the time: What is the connection between what one is thinking and one's physical location on the ground? So I went to the hardware store and got some yellow surveyor flags and walked around the upper west side. When I had a thought that seemed developed enough to relate in written words, I stuck the flag in a crack in the sidewalk and took a picture and wrote down what I was thinking. I left the flags where they stood. Another book, "Occasional's Thoughts" was based on the musings of a fictitious child, Occasional, who would walk through zones of urban decay with her doting father, Sigvaard, who would write down what she would say as they passed by certain locations, seeing certain things. In many ways I'm glad that I learned about psychogeography and the situationists after doing these projects. If I had known about this tradition, I would have probably altered the work in some way. In the little reading that I've done up to this point, I think I can see a strong connection between the theories and methods of archaeological investigation with psychogeography and situationism.